2011 April — I See Hawks in L.A.
Notes: April 21st is Ira Louvin’s birthday so The New L.A. Folk Fest is celebrating the legacy of these country pioneers in Los Angeles. 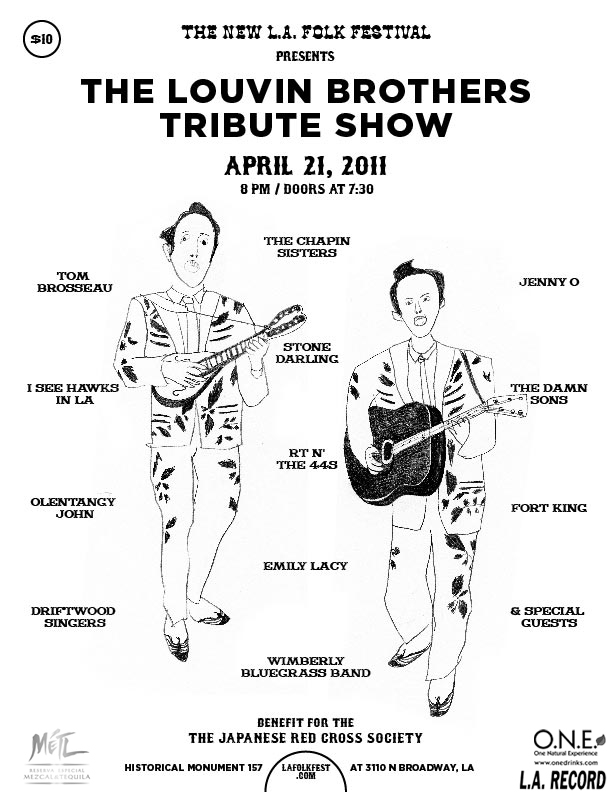 Featuring live covers of Louvin Bros songs by Tom Brosseau & John C. Reilly, Chapin Sisters, Jenny O, Stone Darling, I See Hawks In LA ft. Tony Gilkyson (of legendary bands X & Lone Justice), Driftwood Singers, The Damn Sons, Olentangy John, Fort King, Emily Lacy, RT N The 44′s, Wimberley Bluegrass Band, The Damn Sons, and more special guests that will turn you into a rootin’ tootin’ boot stompin’ swangin’ sinnin’ but possibly god fearin’ hillbilly. Proceeds from the event will be donated to the Japanese Red Cross, as part of The New Los Angeles Folk Festival’s MONTH-LONG tsunami relief fundraiser. We’ll be taking donations at all our events and online throughout April.